Nowali have been producing original moccasins since 1950 making full use of their Scandinavian heritage and passion for handcrafted products. 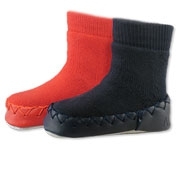 These Swedish moccasins for children are still hand sewn, so not only are you buying a high quality product you're buying a Swedish tradition! Nowali moccasins are a unique concept, combining the qualities of a sock, a shoe and a slipper.